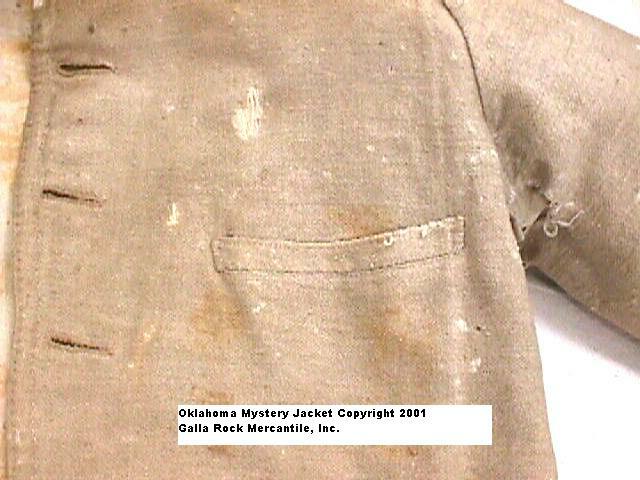 Details of the "Oklahoma Mystery Jacket"
Our special thanks to the Oklahoma State Museum, including Jean Winchester, Matt Reed, and Whit Edwards, for their assistance in allowing us to photograph the upclose details of the coat and to allow us the opportunity to take measurements of the coat that has been dubbed the "Oklahoma Mystery Jacket". 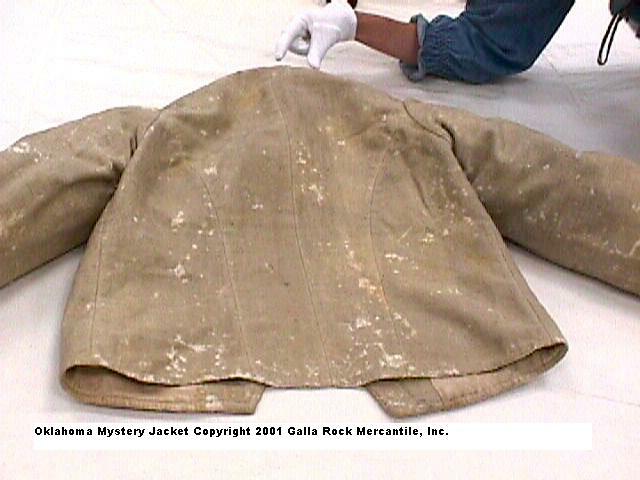 The origins of the shell jacket were lost many years ago. For those of you who have reviewed Geoffrey Walden's photos, you will notice that the placement of the button has been moved since his photo that was taken in the early 1990's. The button came off and was apparently re-attached at the top, more than likely to facilitate better display. You can see the original location in photo #1. 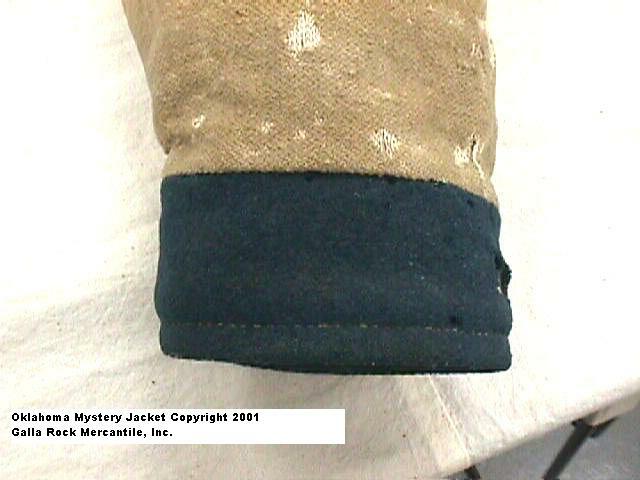 The trim of the coat, even though viewing in normal light appeared to be a medium blue kersey, was a perfect match to Family Heirloom's Dark Blue Kersey on the interior collar portion that had not been exposed to the light. 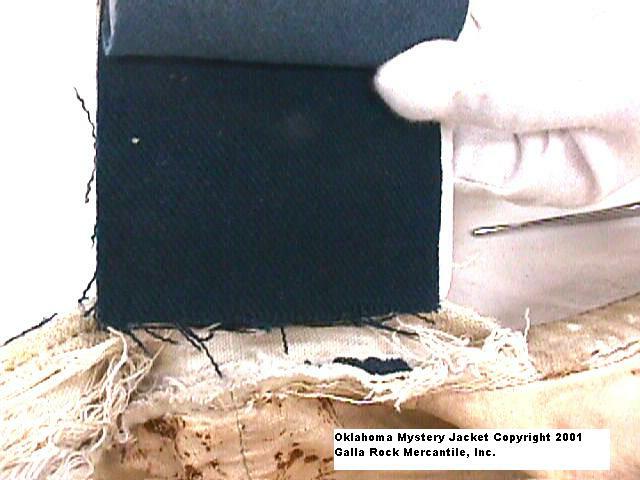 The jean texture and weight fell between the regular jean and the finished jean, and was a fully natural wool color. Pat Kline is currently working on reproducing the jean for us. 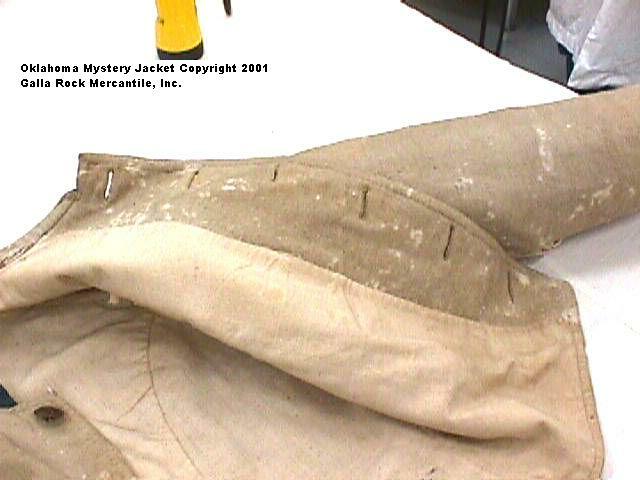 The Coat appears to be fully handsewn. 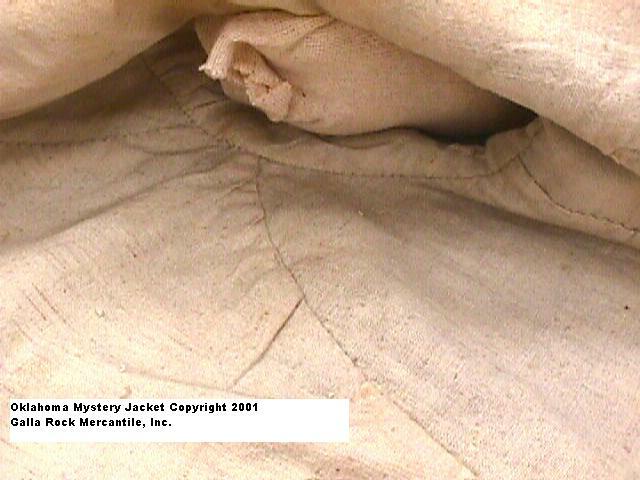 Photo #1- showing the unusual double row of topstitching along the outer edge and an additional row to the inside of the button or right side of coat. The double row goes completely around the edge of the coat. 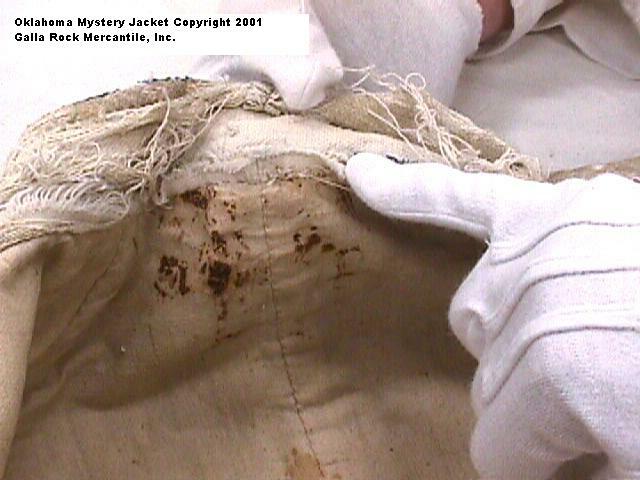 Photo also shows that the jean was on a white warp. Cast Brass block "I"
Photo #2-Details of the concave back of the cast brass "I" Button. 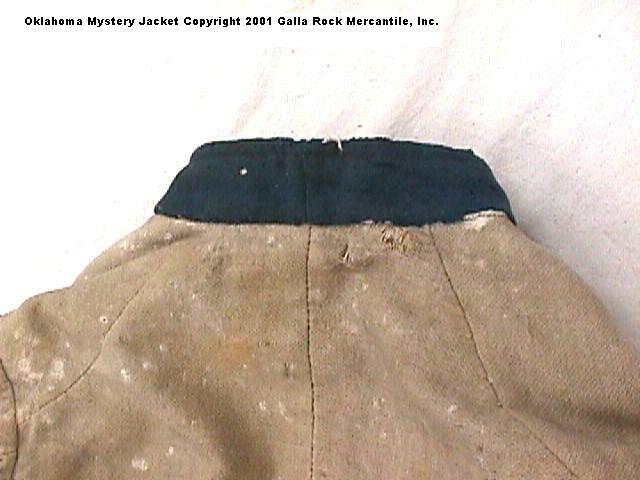 Photo #10-closer view of back at collar. 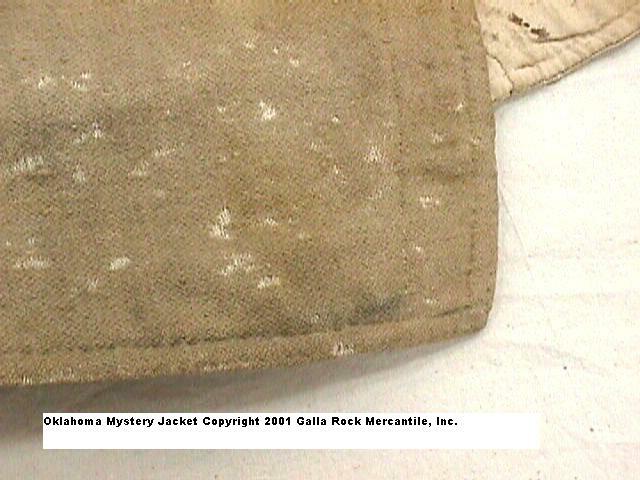 The outer and inner collar are each two pieces and the lining is one piece-note how the back center piece at collar narrows. 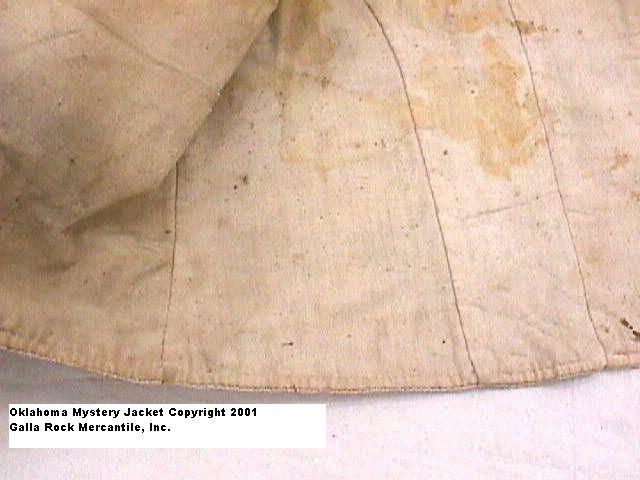 Photo # 12-interior of coat at sleeve-note the narrowness of the back piece where it meets the sleeve and how wide the side back piece is at the sleeve. 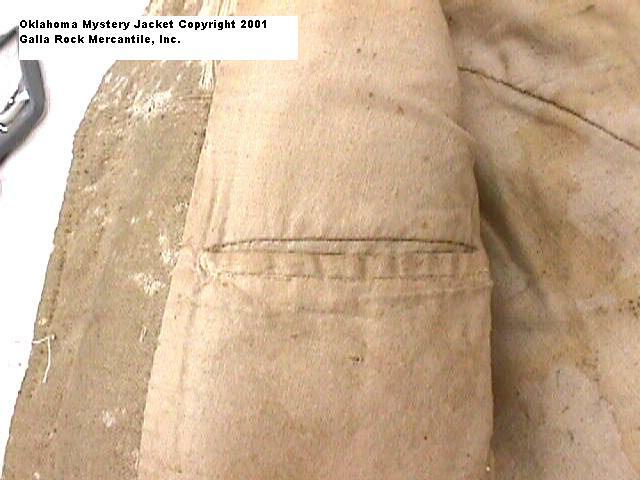 Photo #14-exterior cuff attached to the jean sleeve-one row of topstitching at wrist. 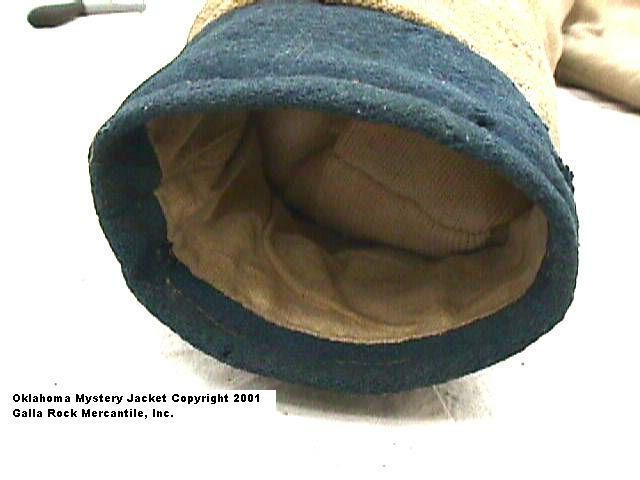 Photo #15-Interior view of cuff.